The Robinson Projection used for this Raised Relief World map is a more accurate depiction of our round planet. 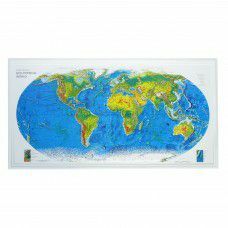 Continental coloring on this Raised Relief World Map indicates features such as ice and snow regions, high barren areas, tundra, needle leaf forest, broadleaf forest, tropical rain forest, grassland and desert. Ocean coloring indicates the continental shelf, trenches, ridges, seamounts and basins. Country border and names are shown, as well as major cities and lakes. Map scale is 1:46,875,000 or 1"=~750 miles.